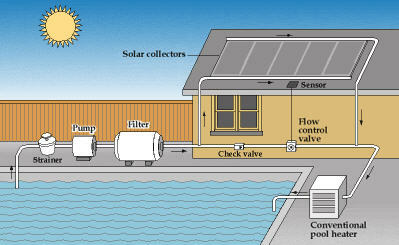 Probably the most cost-effective use of solar energy today is pool heating. Cambridge Heating & Cooling provides systems that are ideal for heating swimming pools. An outdoor pool can use inexpensive solar pool collectors that can deliver the energy required to heat the pool. The most monumental as well as cost-effective utilization of solar energy in the current era is pool heating. Cambridge Heating & Cooling specialty is inclusive of furnishing systems that are perfect in order for heating swimming pools. An outdoor pool is competent enough of utilizing immensely economical solar pool collectors which can render the energy essential in order to heat the pool. Solar is also optimal for heating indoor pools. You can base your final decision on a system exclusively designed for the pool, or you can install a system proficient enough of making possible the provision of heat as well as hot water for the house, additionally capable of heating the pool also. Our Solar systems executes automatically, does not limit maintenance, incorporated by simplicity in quality of design, as well as renders years of cleanliness, and hold out distinguished image in accomplishing reliable heating as well as significantly economical energy.